OIL-GAS: Crusades, Jihadists And Conflict Resolution-Part III. 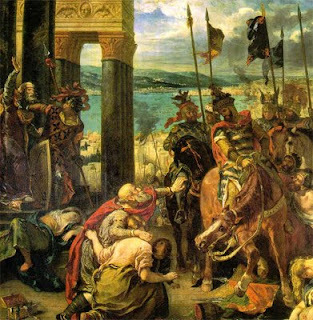 Crusades, Jihadists And Conflict Resolution-Part III. Coming back to Hamas and Hizbullah and Kashmiris militants, and their legitimate causes (but not their practices against civilians). Every person with mind stands against terrorist acts against civilians (Jews or Christians or else), but in the same time their argument is logical as oppressed people in a world does not recognize their rights. In a world did not respect rights and appreciate power. When dignity is lost, every body may have to pay to regain such dignity in any way possible. The United States to regain its dignity loss in 911, strived and brought all its alliance friends to stand with her, (including some Arab states: Egypt, and Syria etc.,) in order to regain American dignity. If we blame America for its wars in the Middle East, Jihadists in Hamas and Hizbullah must be blamed for fighting for their dignity. Both are wrong by using the only method to regain dignity, undermining other solutions for conflicts which should be on the table to solve them, even in terms of retaining dignity to save civilians rights in the free world. The question remains: Who causes all the recent miss in the Middle East, the Jihadists, or the Western poppet, Democratic Israel in the Middle East? Invading Iraq was an attempt to save Israel, which occupied Palestine, that was the main cause I invite any one to find the causes, no one may miss them. Because in logic and reasoning, we learned, the true consequences followed mostly by the true causes. Conflict Management in this case, should take religion as encouraging factor to solve disputes. For several reasons: 1) more than two thirds of the world population belong to a religion. Where according to data ten years ago, 29.2% of the religious constituency was Christian; 17.9% Muslim; 13% Hindu; 5.7% Buddhist/Shintoist; 0.7% Confucianism/Taoist. Together, all those religious organizations have a huge infrastructure with a communication network reaching to all corners of the world. They have a great responsibility and leadership is expected from them. 2) Religious organizations can rely on a set of soft power sources to influence the peace process. Scientists on conflict resolution developed a useful taxonomy for understanding the different bases of power. It asserts that six different sources of power exist for influencing another's behavior: reward, coercion, expertise, legitimacy, reference, and information. (Raven and Rubin, 1983). Only rewards and coercion are used by the United States, rewards to governments, and coercion of these governments to abide with rules of War on terrorism instead of rewarding Jihadists by understanding their requests, and solving injustices historically made earlier, the United States is using power to give them illegitimacy and coercion. I believe that religious organizations have a major impact on inter-communal and international conflicts including the Jihadists. During the Cold War, religious as well as ethnic and nationalist conflicts were relatively neglected in the study of international relations and peace research. After the defeat of the communist block, the escalation of nationalist and religious conflicts were observed. The religious dimension of conflicts, remains an under-researched field. There is no useful typology of religious conflicts; it is also observed, that no serious study of the impact of religious organizations on conflict behavior; no comparative research of peace-making and peace-building efforts of different religious organizations. Generalizing terrorism to Islam as a religion, (As atheists and others claim) will deteriorate the situation and block peaceful solutions. ** Dr. Hasan Yahya is a professor of sociology and a culumnist at worldfutures, Malaysia, and TINA International News Agency, Chicago, USA.